The third York Open Short Lawn Tournament was fully subscribed, with 24 entrants coming from all over the country, including the south coast and East Anglia as well as all parts of the north. The York Open remains the only short lawn tournament in the Croquet Association Fixtures Book. The camaraderie was excellent, strongly aided and abetted by a large Southport contingent and by plentiful supplies of home-made cake. York shared the cool weather affecting the rest of the country but enjoyed two days without rain, and the high quality York lawns played well. Runner-up Callum Johnson (playing off short lawn scratch) showed trademark mastery of the lawn throughout the weekend; on his second turn in game 6, with only three balls yet on the lawn, he completed a well-managed all-round break plus two peels on partner ball. But it was one of the Southport contingent, tournament newcomer Tina Kelly, who took home the trophy after two days of consistently calm and careful play with excellent bisque management. Thanks to tournament manager Dave Hudson for organising 24 people smoothly and efficiently through 10 games, and so providing the ideal framework for an enjoyable two days of croquet, and to the many home bakers whose good works made such an important contribution to a successful weekend. Channel 4 comes to York Croquet Club! CAMERA – sound – action! Channel 4 arrived at York Croquet Club in style with full technical support to record an episode of the long-running dating programme Streetmate. The episode featured a young woman and a young man meeting for the first time on the croquet lawn to see whether that special spark would be kindled between them. Both were trying croquet for the first time. After a close-fought game (which the young lady won) the pair retreated to the lawnside to enjoy a summer lunch, laid on by Channel 4 complete with Pimm’s, to start to get to know each other better. They then decided, with the cameras still rolling, whether to meet up for a second date. TEA and cake will be served in York this weekend as some of the country’s most elite croquet players go head-to-head. 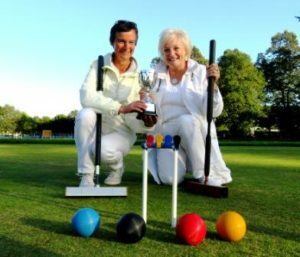 Spectators are invited to the York Croquet Club lawns in Scarcroft Road where the England Ladies team will take on Yorkshire’s all male team, in a match billed as a Battle of the Sexes. Spectators are invited to attend both the Saturday and Sunday games from 10 am to 4 pm. A simple guide to the game will be made available, while club members are preparing tea and homemade cake for visitors. Each day will feature three simultaneous games in the morning and three in the afternoon. Anyone who is heading to the challenge match and wanting to try the game for themselves will be very welcome. Croquet is typically a game of strategy not strength. It is one of the few games played on equal terms regardless of gender or age, and a close result is expected. 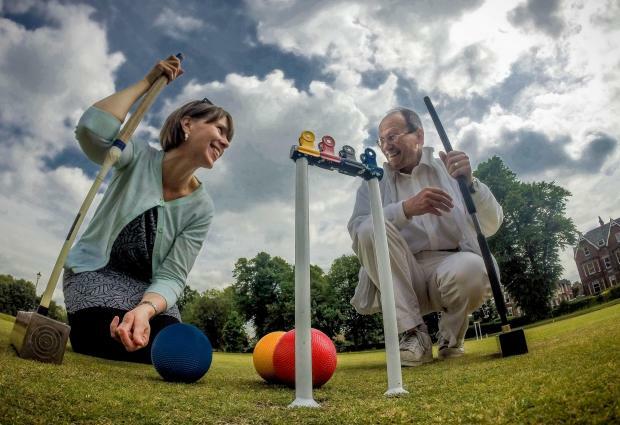 Croquet, known as the Queen of Games, is enjoying a UK renaissance. This surge of interest ensures members of Yorkshire’s eleven clubs are in high spirits as they go into the new season, which runs from April to the end of September. The origins of croquet are obscure. It seems to have been played in Ireland during the 1830s. “Where it came from before that is unknown,” says John. “It’s a real mystery.” Croquet was introduced to England in the 1850s and a club established in York circa 1870. A firm in the city, Cordeaux and Ernest, made equipment and published the rules of the game, as played at Sheriff Hutton Park. Its heyday, during which croquet parties were fashionable, was curtailed by the 1870s advent of lawn tennis. Despite a brief revival in the Edwardian era, its popularity continued to decline. Now, it seems, croquet is making a comeback. The present York club was formed in 1988 and has been at Scarcroft Green since 1992. 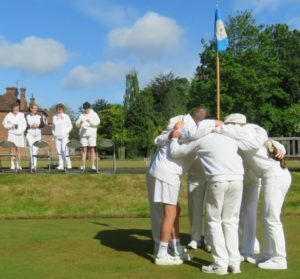 The county’s other clubs, affiliated to the Yorkshire Croquet Federation, are at Ben Rhydding, Beverley, Bishop Monkton, Brodsworth Hall, Huddersfield, Lepton, Pickering, Ripon, Sheffield and Shepley. Sheffield has two clubs, one of which has grown enormously in recent years. All stage a variety of internal and external competitions, and some play in county and regional leagues. York Croquet Club has sixty members. It hosts sessions at Scarcroft Green on Mondays (10am-noon), Wednesdays (6.30pm-dusk), Thursdays (4pm-6pm) and Saturdays (10am-noon). Formats include singles, doubles, short lawn, full lawn, timed and untimed. To increase participation and improve skills, it offers free drop-in taster sessions on selected weekend afternoons; refresher sessions, early in the season; and, for more experienced players, weekend courses organised by the Croquet Association. PRISTINE greens, perfect lines and players dressed in white – you’d be forgiven for thinking we’d turned up at SW19 for the start of the All England Club Championships. But no; we are in the heart of York, at Scarcroft Green, home to the city’s croquet club. If you thought croquet was more Downton Abbey than South Bank, be prepared to ditch your prejudices. The sport is having its moment. “Participation in sport was all set to grow after the Olympics, but in most sports it has declined. 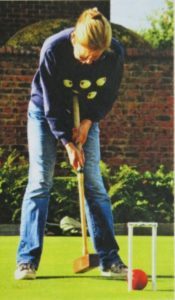 Croquet is slowly growing across the UK.” So says John Harris, who took up the game 12 years ago and is now chairman of York Croquet Club. Membership is up almost 50 per cent in a year, from about 30 to 45. And it’s continuing to build, thanks to series of short, introductory courses run by the club this year. There are two types of croquet, explains John: social, where players take it in turns to strike the ball through hoops, and strategic, where players can earn extra shots and plan their offence by plotting advance moves, much like chess. The latter is played – and taught at the Scarcroft site – and club members regularly compete in leagues, pitting their skills against rivals across the city, Yorkshire and the North. 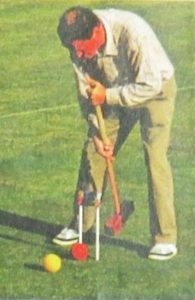 It’s perfect croquet weather when I meet John for a taster session. The sun is out and the lawns look inviting. Next to us, a couple are playing: the man relaxing in a deckchair while his wife sizes up her shot and swings the mallet like a pro. First things first; John teaches me the grip. I’m right handed, so my left hand holds the top the mallet, knuckles pointed outwards at “11 o’clock”. My right hand hugs the handle beneath. He then encourages me to stand astride the ball and slightly behind it, so that if I swing forward, using my shoulders rather than my wrist, I should strike the ball. “It’s like a pendulum motion,” he adds helpfully. We’re soon on the lawns and knocking balls here, there and everywhere. I manage to punch a couple through two hoops and feel surprisingly satisfied. John shows me some other shots, particular to the strategic game, where the idea is to hit the ball just so that it and its adjacent one split and fire off into different directions. And the sport is really one for all. The York club has players aged from nine to ninety. The club also has the advantage of having some of the finest lawns in Yorkshire, carefully maintained by City of York Council, with the grass mown three times a week. 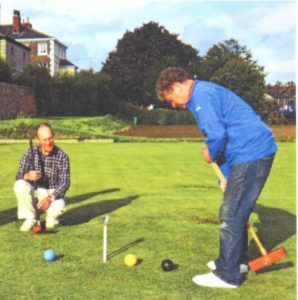 “The quality of the lawns means we have been able to get the Croquet Association of Britain to run national courses here,” says John, who is an accredited coach. Robert and Lesley Harris were the couple playing on the lawn next to us. They are from Harrogate and play bowls and social croquet at a club in Ripon. They’ve just completed the strategic croquet course at Scarcroft with John – and are hooked. And despite its image of being a sport only for a summer’s day, John says they play in the wet too. In winter they can even practise indoors at a facility in Bishop Burton. Members also meet up through winter to play board games – to help their strategic thinking.